« Sea Vegetables & Have you heard About the Free & Fun Workshops at The Cog? Spring inspired at the market. All pale greens and golds. This was a quick dinner to make (not counting prepping the artichokes). I simply roasted them with sliced garlic, olive oil, and salt, and then whisked together shallots, green garlic, fresh parsley, Meyer lemon juice, and really good olive oil and drizzled it over them. 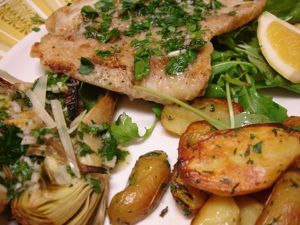 The potatoes I roasted with olive oil and salt, and the fish, which was petrale, I dredged in flour seasoned with salt and pepper and pan-fried it with a mixture of butter and olive oil. Then I drizzled some of the same sauce over the fish. (I know, that would be annoying in a restaurant, but this isn't a restaurant) There's a little arugula peaking out underneath the fish–undressed. That's it. I owe a great debt to River Dog Farm for this dinner. Their Saturday stand at the Berkeley market supplied the artichokes, green garlic, and the potatoes. Only the parsley was from the garden.